The majestic spire of St. James Anglican Cathedral in Toronto, Ontario, Canada reaches to the heavens. The Church of the Holy Trinity is an Anglican church in downtown Toronto, Ontario, Canada at Trinity Square. The church was built in 1847 and is located in a dense business zone off of Yonge Street right behind the Eaton Centre Shopping Mall. It is dwarfed by all of the buildings surrounding it but still has an appearance of majesty in it's location. Rather than using a tilt shift lens on tall spired churches, I prefer a standard wide angle to reinforce the effect of sky-piercing height. A dramatic sky helps as well. Buffalo, NY is known for it's tremendous variety and quality of architectural examples. This Presbyterian church on Delaware Ave. is no exception. Built in 1858-59, this church is a jewel of Buffalo area architecture. St. Mary's Orthodox Catholic Church in Niagara Falls, Ontario, Canada. St. Mary's Roman Catholic Church in Medina, NY. NY state being as old as it is, has some amazing, large old churches in some of the most "out of the way" towns. Medina is on the old original NY State Barge Canal (Erie Canal) and was a stopover point. At the turn of the 20th century, Medina was a thriving industrial town. The church is built with "Medina Sandstone" a dominant stone used for buildings in the region. The Mormon Temple in Salt Lake City is a dominant and iconic structure in the city. Visible from all parts of the city, this structure glows with light at night and brightens the skyline during the day. During my recent trip to Yellowstone I took the opportunity on my last night before returning home to photograph a few of the interesting architectural sights of Salt Lake City. Door To St. Mary's R.C. Door To St. Joseph's R.C. The main entrance is beautifully framed and the upper windows add great interest to the facade of St. Joseph's. 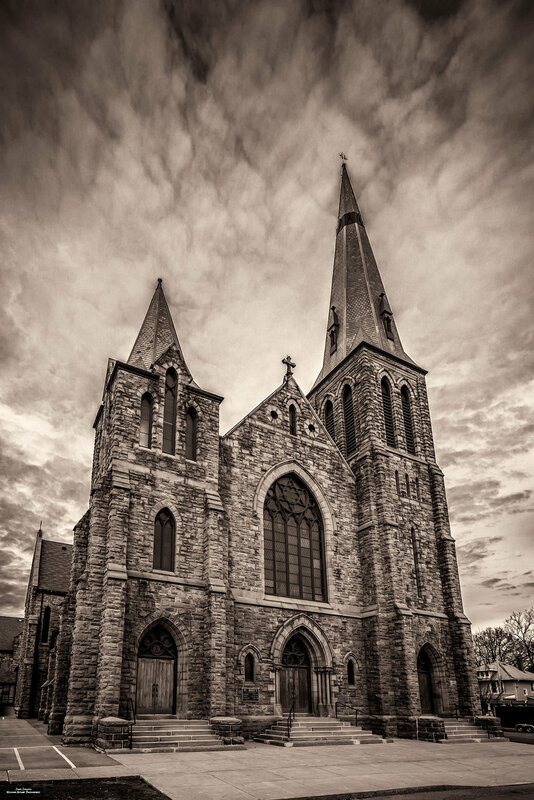 Dedicated in 1855, this is the cathedral of the Roman Catholic Diocese of Buffalo NY.